Wine and roses. I like them both. The former perhaps a bit more than the latter…but I digress. 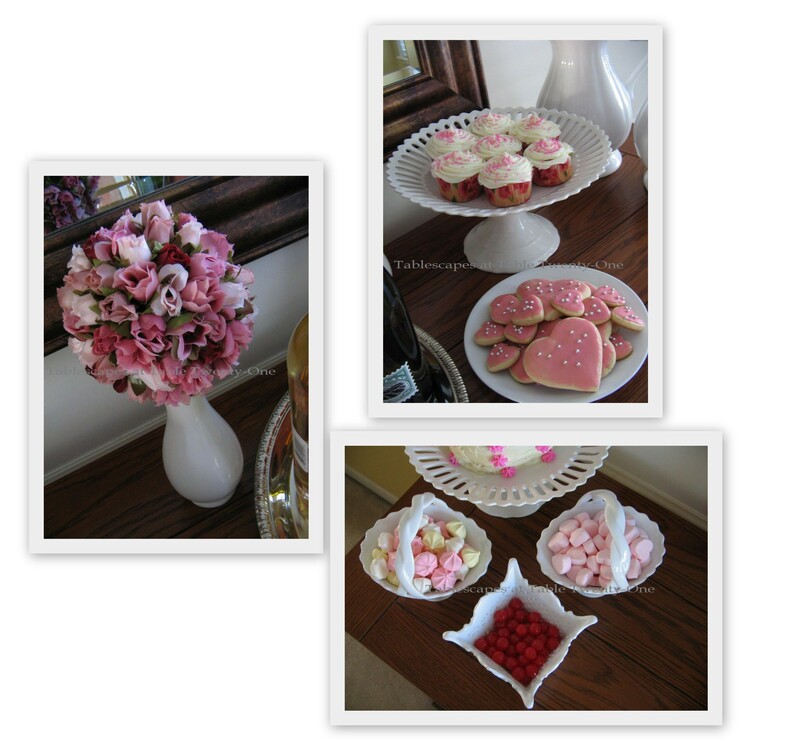 Valentines Day is the perfect time to break out the wine, the roses, the chocolates…and the pink!!! Yes, it’s another pink Valentine’s Day table, but this time it is mixed with a deep, delicious burgundy. This simple but sweet mix of modern and traditional could be easily transformed from a Valentine’s Day tablescape to one for a wedding, bridal shower, birthday, or to honor a breast cancer survivor. Each place setting has a pretty floral placemat adorned with vintage roses. The placemat from Pier 1 is reversible. (Click HERE and scroll down to “Pretty In Pink” to see how they were used with the reverse side.) The white charger is from Old Time Pottery, topped with a modern B. Smith square dinner plate. Mercury-colored heart-shaped salad plates purchased years ago from Big Lots complete the stack. 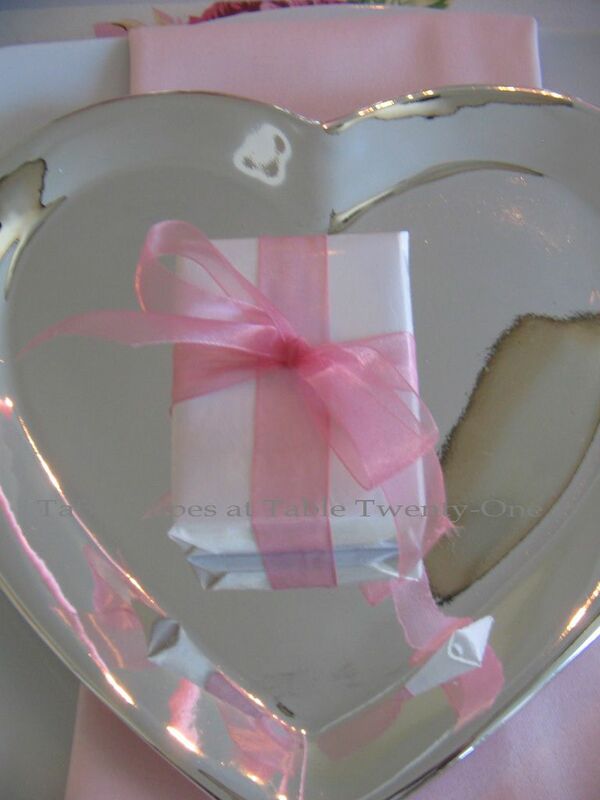 A soft pink napkin works to separate the white-on-white of the dishes. For each guest, a favor they are sure to enjoy…a box of chocolates simply wrapped in shiny white paper and tied with a gossamer pink ribbon. Another bit of modernity is interjected with the J.A. Henckels “Bellasera” flatware. I was thrilled to find this Pier 1 stemware finally hit the clearance shelf at 70% off! It’s traditional shape is kissed at the bottom with mercury-colored glass that lends a sultry modern look. 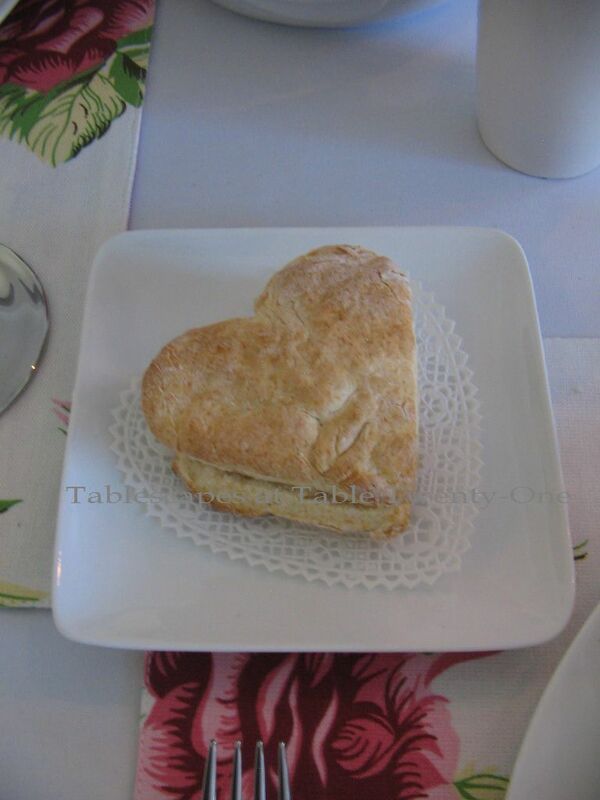 Fluffy heart-shaped biscuits are served up on a little paper lace. The Crate & Barrel appetizer plates are the perfect size for it. 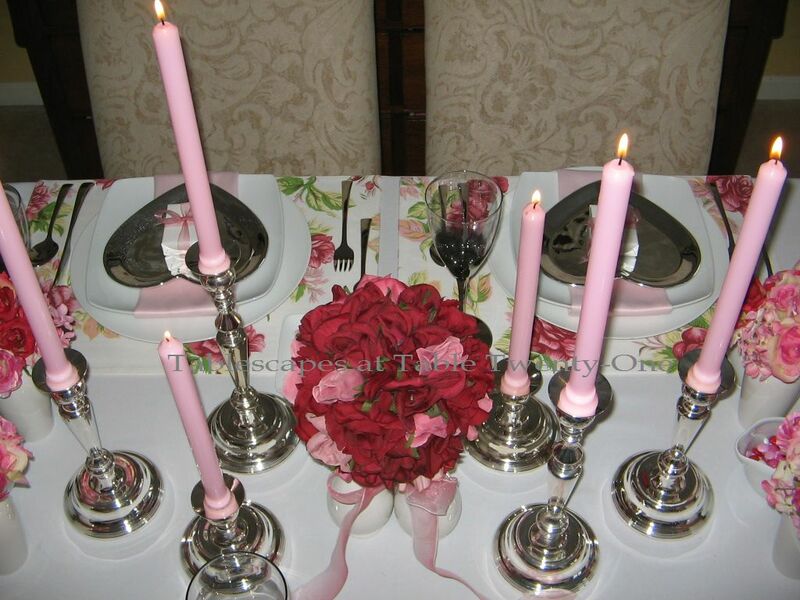 The table decor is an extension of the silver, burgundy and pink elements at each place setting. Tri-level silver candlesticks hold pink tapers, and a trio of white ceramic bud vases from Michael’s merge – courtesy of a length of Ombre ribbon – to form a pedestal for a pink & burgundy rose ball. I used these white swan gravy boats from Pier 1 as candy dishes at each end of the table. Swans are a symbol of love & fidelity which makes them a perfect choice! (Plus, I had no time or money to go out searching for actual candy dishes!) They are flanked by a nosegay of roses & hydrangea in the same vases used for the centerpiece. I love the look of a stark white full-length linen, but this time I wanted it to better reflect what was going on up top. I remembered a bunch of tiny silk rosettes purchased years ago from Hobby Lobby. (They are now harder to find and much more expensive than the 9¢ apiece they were ten years ago!) Because I’m not a wizard seamstress like my next-door-neighbor, Barbara, who would have whip stitched these on in seconds flat, I took the time to pin each rosette. (Whatever, Barbara! Move on! Get over it! :-)) I made sure to gracefully position the 4 corners of the tablecloth to showcase the rosettes there. Kind of reminds me of the train of a wedding gown…which is why this would make a great table for a bridal shower or wedding, too! The buffet repeats the colors and theme used on the table. 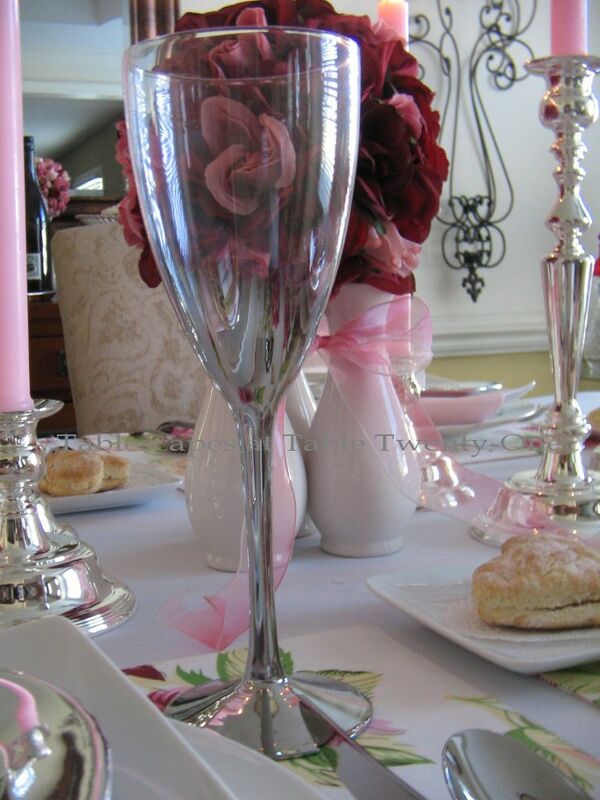 Multiple bottles of wine are gathered on a silver platter with a pink pillar candle to illuminate the glass. 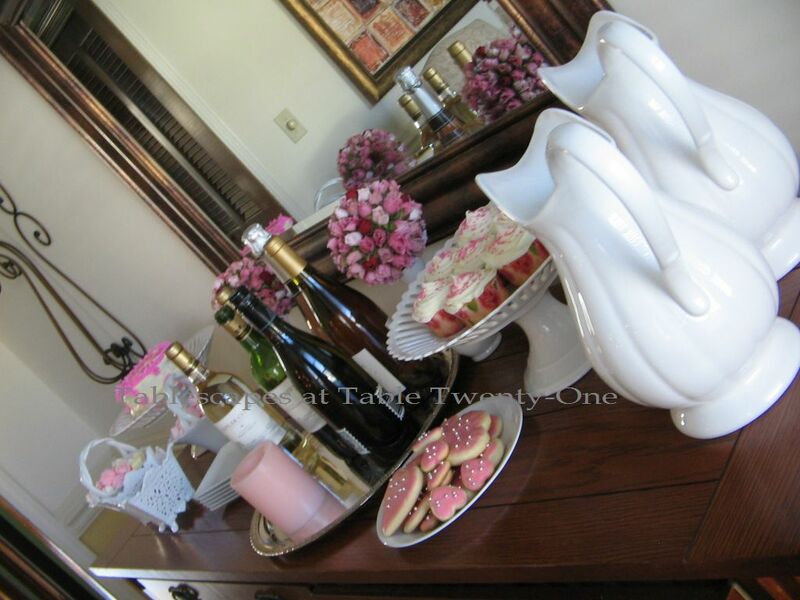 A variety of white ceramic dishes holds candies, homemade sugar cookies decorated with silver dragees, cupcakes in rose-patterned paper holders, and a white layer cake with raspberry filling. (There is no close-up of that cake because that bad boy started to slide in the warmth of the room!) Miniature versions of the burgundy & pink rose ball used for the centerpiece bring a little more color and texture to the buffet. 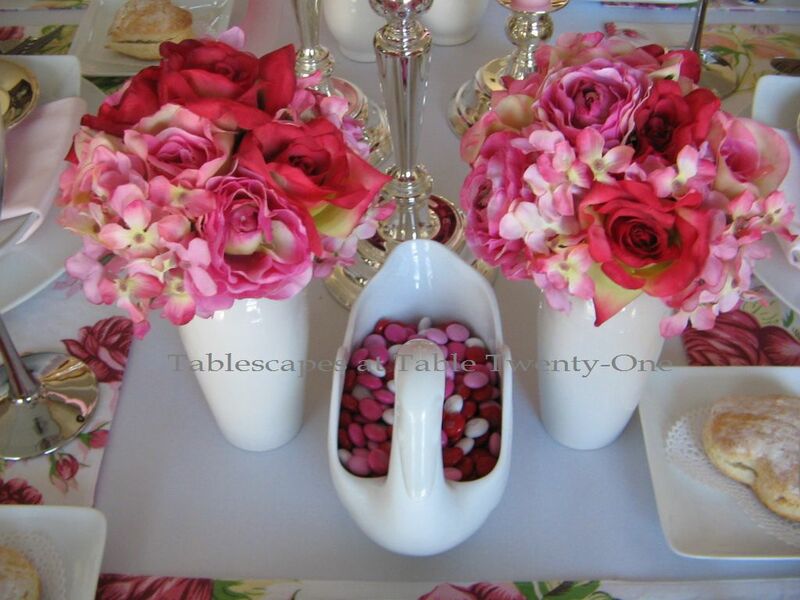 I will be joining Susan and the other lovestruck tablescapers from around the world for Tablescape Thursday this week. Be sure to tune in to see what they’re up to! This reminded me of a friend’s wedding years ago. Her scheme was pink, burgundy and creamy white, and yes, they were married at Valentine’s. Just gorgeous and so romantic. It is ALL beautiful. Alycia this is so pretty, feminine and elegant! I think most women want that extra feminine touch on Valentines Day! I’m in love with the tablecloth and the little roses on it! Very pretty and absolutely unique! The flowers are so perfectly done and there are so many! The Pier 1 glasses are beautiful and add to the elegant look here. 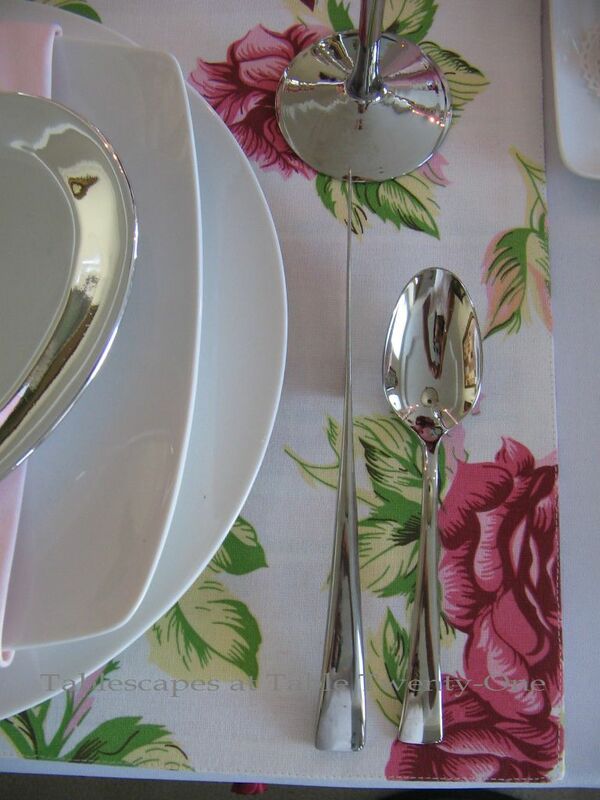 Those silver hearts are so cool and I love the way that knife sits on the table- very pretty flatware! The napkin fold is perfect! I’m digging on the cookies and candy! Oh oh, there goes my sweet tooth!! When should I arrive?? Girl you have such creativity. I can’t believe you pinned on all those rosebuds. What a stunning tablecloth and table. Such neat cutlery too! Your place mats are beautiful! I just love it all! Alycia, Everytime i see one of your tablescapes, I think…this is the prettiest one yet…and it is.!! Love the placemats and silver heart shaped plates. and the shades from pink to burgundy. Those heart shaped biscuits are so unexpected and on a doily no less. Now did you bake those? Thanks for setting another gorgeous table, and Happy Valentine’s Day! How lovely Alycia. Delia would just love sitting around this table with a few of us ladies. 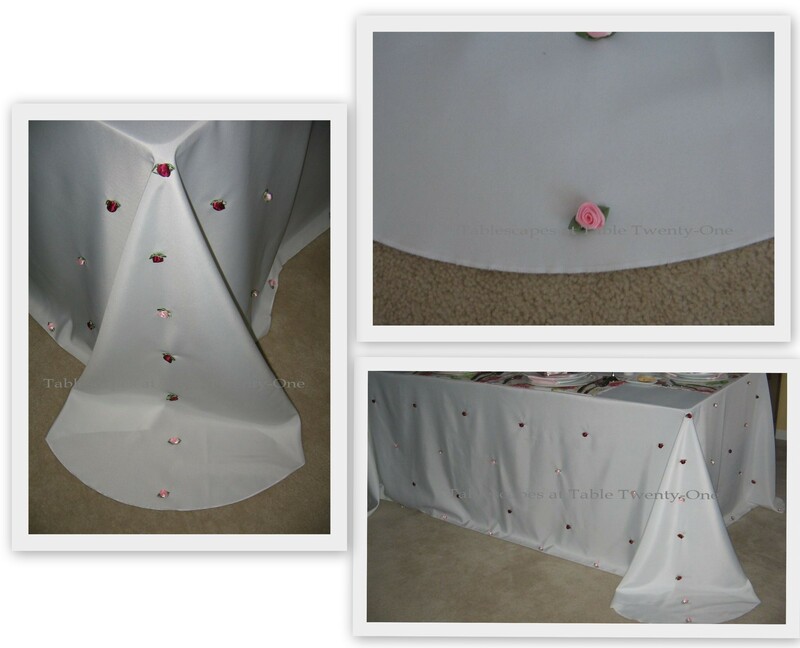 The handywork on the skirt of the table cloth is so creative and dainty! Oh my stars girl…this is just GORGEOUS! Your table, the cloth and the way you added the roses…by the way you can get a gazillion in a bag at Walmart just like those for under $2. And your centerpiece and the tablesetting just blows me away. Love love love the mercury silver heart plates. Wish I’d found them. Need to get to big lots more I guess. Every single detail, right down to your beautiful homemade goodies…well its all to die for. You have outdid yourself. Can hardly wait to explore the rest of your blog. I’m drooling over all your creativity. I love the heart shaped plates ! Lovely Alycia…..Love the pink and you are putting it to good use. Perfect for Valentines or ? The tablecloth is adorable with the rosettes attached. A beautiful feminine table to enjoy. Thanks again for sharing your fabulous table. That’s it. This has just leapt to the top of my list as my favorite Alycia table ever. (Betcha didn’t know I had a list in my head) I love every single thing about it. Those heart salad plates are my favorite part. Just perfectly pink and elegant. I LOVE IT. Beautiful as always Alycia! Love the tablecloth! And the placemats are sophisticated enough to make it “not your Grandmas table” Love it! Alycia, this is SO, so pretty! 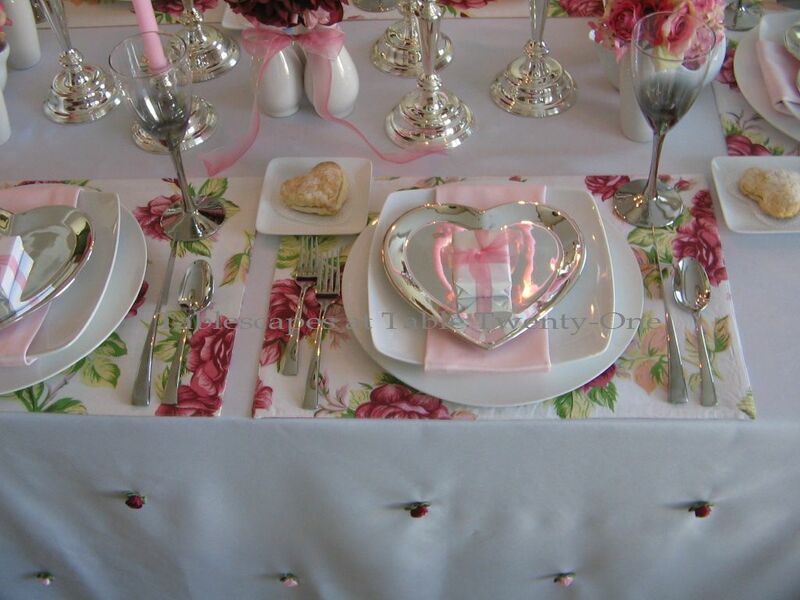 Love the floral placemats and the silvery heart-shaped plates. Adding the little wrapped candies was a wonderful touch! You get the Patience Award for pinning on all those flowers! I’d have been ready to get out the glue gun! Love it! Those silver heart plates are amazing!!!! What a score. I don’t know about you, but lately I don’t find anything at Big Lots. I haven’t for quite some time. Great tablecloth too. I’d love to have you come link to Seasonal Sundays this Sunday. Really Alycia, do we need another sewing lesson? It is absolutely gorgeous & if the rosebuds were just a one-time use on the tablecloth, I’m not sure sewing & unsewing them would have been any faster. Next time though, you might try glue dots. I bet they would hold & be faster. We’ll have to experiment!! Let me tell all your fans, it is so much fun having Alycia as a neighbor! I can see you have been browsing your storage areas to find all these wonderful pieces with which to create. Where to begin? I love the little wrapped candies, the combination of pinks in the flowers, the heart shaped plates….well, you get the picture. Once again I so appreciate your creativity. As for the wine and roses, I’m right there with you. Another amazing table. I love those silver heart plates and the stemware with the touch of silver down the stems…perfect. The rosebuds on the table cloth are amazing…I have to say, I would have never come up with that idea…only because about 4 rose buds in, I would have been saying something not-so-nice and a certain 3 year old would have to drop the tone of his voice and say “Mommy…we don’t say that” in a very disapproving tone 🙂 but they do add an amazing effect to your table! Thanks so much for sharing and giving all of us such great ideas! Have a great weekend! Stunning, Alycia! I love the heart shaped mercury colored dishes and stems…just gorgeous. Oh, you genius! I LOVE that you pinned the rosettes on! And I adore the pink converging with/contrasting with the burgundy. The burgundy gives the whimsical/romantic pink a regal essence, too. And using the beautiful pieces you already have as candy dishes, yes, yes, yes!!! And I love the graduated candle heights. And the floral placemats. And…everything. I think you are marvelous at what you do…but you are also an incredibly kind and wonderful woman. THank you for your beautiful comments on my little blog and your prayers for Tom–I appreciate that so very much!!! Thanks lovely Alycia for your great visit…I just adore when you come over, wish it was for real too, lol! You are a lady of great taste and I love that. I have tons of Oriental things in everything to make tables, but I was into my Bil’s 300 yr. old hacienda posts and I just missed it, but last year I did a couple of real Oriental ones. The set is gorgeous, everything is oriental mixed and matched, and very different in shape too and it came like that! Happy Valentines sweetie. Alycia, your table is just gorgeous! The dishes are amazing and the tablecloth beautiful! I am your new follower! Big Lots? ARE YOU KIDDING ME? I thought for sure they were some kind of heirloom? I am learning so much. 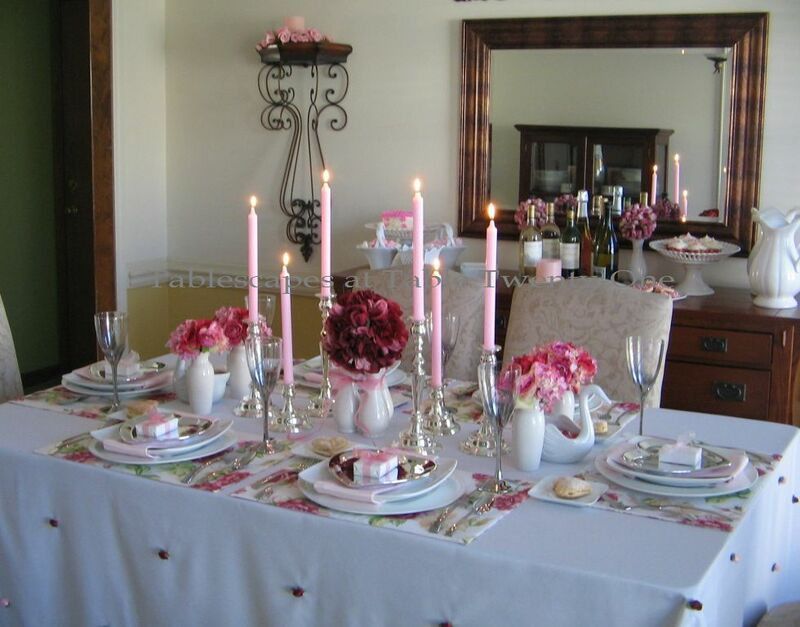 I have also learned that Valentine tables do not have to be cheesy, which is why I have always steered away from decorating for that particular holiday. Instead, the tablescapers have been displaying very elegant, very tasteful tables. I love your swans, and have always thought of them as romantic, too. 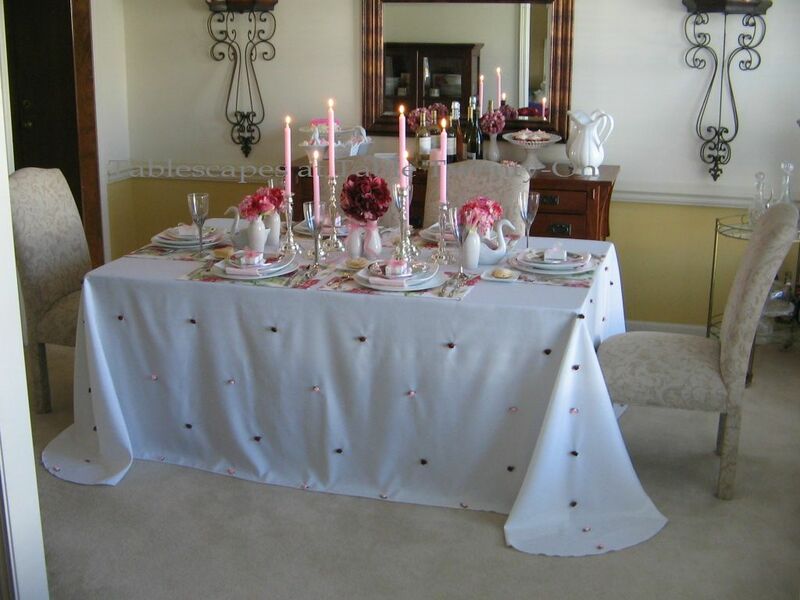 The sweet little rosebuds are a wonderful touch on the tablecloth, and the placemats are just beautiful! As for the food, how do you not weigh 300 pounds? I would eat everything in sight. I salute your willpower! Beautiful table. What a fun find on the clearance glasses! Your buffet is set beautifully. I love all the white-ware! Oh, this is just gorgeous. Love those heart plates and wine glasses. I don’t know how you find the time to do all that – pinning on roses and baking and just all the attention to detail. It’s absolutely beautiful. How did you do?? Seriously?? Fabulous.. Amazing.. Love the pretty flowers pinned to the table.. Love the pink and burgundy, love the dishes, want the cookies, and I love those glasses.. Can you say i’m smitten? yes, indeed. your tablescape is so pretty! This is such a delicate a delicate setting, perfectly pretty in pink. Those heart chargers are gorgeous, love it all. That rosette thing you did at the four corners of the tablecloth is such a great touch. That idea is now filed away in my digital idea scrapbook. I’ve never especially cared for lots of formal prints on the table, BUT I love the idea of a white tablecloth and those wonderful floral placemats. I would never have thought to do that – and it works so well sandwiched between the white tablecloth and the white dishes. 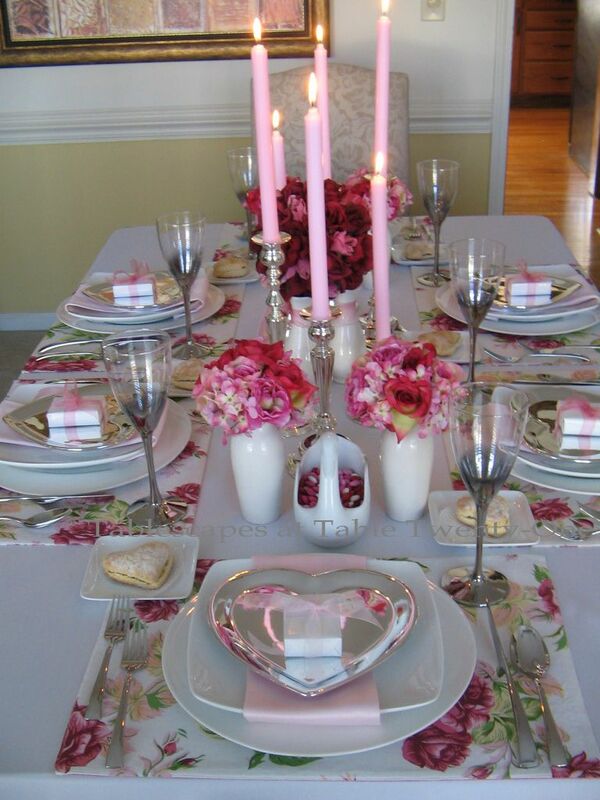 Your Valentine’s table setting is beautiful! I love the mercury glass stemware and heart plates. They give a touch of modern elegance to the traditional table. Thanks for visiting me today and for your sweet comments. You are a great tablescaper and writer! What a delightful post. I love your heart plates and admire your creativeness with such a myriad of details to embellish. Beautiful! I love the cloth, and arent you clever! You have such beautiful candlesticks! Very lovely table, so soft! This is truly beautiful!! The pink and white with the burgundy is so romantic and, dare I say? Girl-y…in just the right amount to share with your sweetheart. Your flowers are beautiful too! Your food looks so yummy too! Beautiful Alycia. I have scrolled up and down your post several times and it is so stunning. You have great descriptions of each aspect of your table right down to the tiny roses pinned on the tablecloth. You have a Valentine Tablescape that makes me want to come over. Oh my goodness!! so elegant and beautiful!! I would love to be sitting at this table. just lovely! Your tablescape is unbelievably romantic!..You always manage to present such exquisite dining for all of us to swoon over…Love all the rosebuds, love everything! This is so flat out gorgeous! Love the swans and the pretty rosebuds. Wonderful silver hearts too. About my table…..heck no! I don’t want snow…..I was just reminding myself that there is still plenty of winter left and the possibilities of snow. Even though the nice mild weather has had us fooled into dreaming of spring.